A SCORM package is a collection of files which are packaged according to an agreed standard for learning objects. The SCORM activity module enables SCORM or AICC packages to be uploaded as a zip file and added to a course. For instructions on adding a SCORM package, see Moodle 3: Activities & Resources: Add SCORM Package. In the General settings, the instructor can designate a title and provide a description what the SCORM package includes. 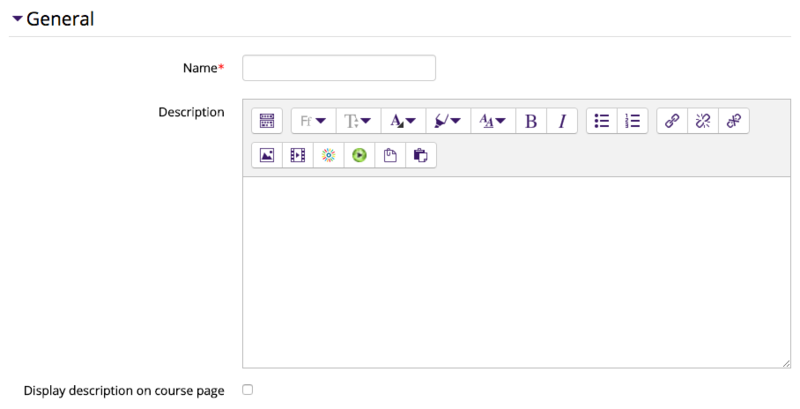 Instructors can customize the appearance of the SCORM contents in this section. The package can either be displayed in the current window or a new window. Instructors can set the dimensions of the window, set options about displaying menu bars and whether students can scroll, display preview mode, where navigation is located, etc. Further customization can be done by clicking on 'Show more' at the bottom. If enabled, instructors can specifiy a timeframe in which students have access to the SCORM package. The maximum grade can be any whole number between 0-100. Instructors can specify the number of times a student can attempt a SCORM package. If it is set to more than 1, instructors also need to select how Moodle will grade the attemps. Instructos can also choose to force a new attempt and lock after the final attempt. Auto-continue: If enabled, subsequent learning objects are launched automatically, otherwise the Continue button must be used. Auto-commit: If enabled, SCORM data is automaticaly saved to the database. Useful for SCORM objects which do not save their data regularly. Mastery score overrides status: If enabled and a mastery score is provided, when LMSFinish is called and a raw score has been set, status will be recalculated using the raw score and mastery score and any status provided by the SCORM (including "incomplete") will be overridden. These settings specify the visibility of the SCORM activity for students (Hide/Show), and the group mode and grouping can be designated. The activity can be restricted based upon a date, group, activity completion of another activity/resource in the course, etc. By default, students can manually mark the SCORM activity as complete, but an instructor can change this to be required. If required, the students can be marked complete by viewing the activity, receiving a grade, making a minimum score, or getting a passed/completed status.